The Maldives holiday is off and you’re learning to wash your own dog. Transport to work is still by Mercedes-Benz but now it’s shared with 57 others and you give the bloke up front your ticket when you get on. Despite tough times and re-prioritized expectations, owning a car "just for fun" remains important for many of us. It isn’t going to be new, and certainly not expensive to buy or run, but it has to stand out from the crowd. The vehicles we mention here are unlikely to be first choices for anyone wanting to exist anonymously. Every one of them will get you noticed – in some instances for the wrong reasons – and perhaps contribute to creating life-long friendships. Owning a cool and possibly classic car is all very well, providing you don’t wind up like the bloke in that infamous G-O-G-G-O TV ad. These ones are all keenly supported by spare parts and service specialists and most have spawned active owners clubs. Those that were built before 1986 were designed to use leaded fuel. With leaded now banned, most will need to be fed 95 Octane Premium plus a dose of lead substitute at every refuel to protect the engine valves. On the upside, all of the older cars are holding their values extremely well. Supporting the adage that everyone should own a sports car at least once in a lifetime, we’re suggesting three that are similar in size but quite diverse in character. Best represented are the small, round-town runabouts – five in all including the Mini Moke which could also bat for the sports car team. Finally comes the Japanese contingent. 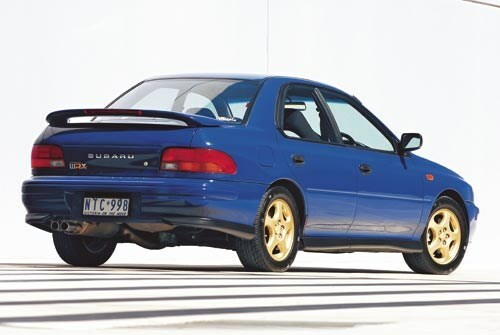 One is a snappy coupe, the other a sedan with impeccable rally credentials and guaranteed to get the neighbours muttering ‘hoon’ as the turbo boost kicks in. Now, get out there and have some fun. If you were driving in the 1960s and ’70s, seeing and even owning a Mini was unavoidable. Britain, with its narrow roads and minds to match, was a little shocked by the Mini – especially when the lowest and highest in the land were happy to be seen driving them. 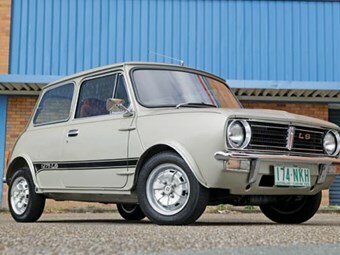 The Radford coach-building company coerced well-heeled owners with leather-trimmed and pin-striped luxury versions and every member of The Beatles had one or more Minis. Ringo even commissioned a custom-made hatchback to accommodate his drum kit. Minis were race and rally winners as well – their results including the 1966 Bathurst 500 where they filled the first 10 places. 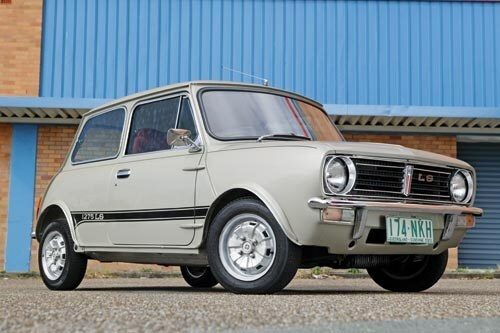 Today, a basic 850 or the bigger-engined Deluxe will cost the better part of $10,000, while top examples of the race-pedigreed Cooper S have topped $25,000. Minis thrive on tough times and crowded streets. Just three metres in length, a Mini can be squeezed through impossible gaps and find parking spots where larger cars dare not go. Even when revved to screaming pitch, 8 litre/100km economy is easily extracted from a 1.0-litre version. Hardly a person in the developed world would not instantly recognise the shape of a VW Beetle. The original version of Volkswagen’s most prolific model hasn’t been sold in Australia since 1976 but there are thousands still running and decades will pass before owners have a problem finding parts or a mechanic who can keep a Beetle running. They also rank among the cheapest cars to run and maintain. Beetles don’t need water because they’re air-cooled – keeping a spare belt aboard for the engine fan is essential – and even the (relatively) powerful 1.6-litre Superbug uses only nine litres of fuel for each 100km of suburban driving. Lots of Beetles have been modified with better engines and bigger wheels and some have been ‘chopped’ into convertibles. All of them seat four in comfort and five at a pinch. Don’t be too scared by stories of dodgy Vee-Dub handling. Sure, the early ones would fall over without warning or apology, but 1970s cars are forgiving and easy to drive. With so many cars still about, prices don’t move much and you can slip into a tidy 1967-76 model for well short of five grand. No ‘proper’ sports car anywhere in the world remains as cheap as a Ford Capri. These Sydney-built two-seaters were Ford’s big hope of taking an Aussie-made car into the North American market, but both sides of the Pacific bagged them for poor build quality and matching performance. Early ones leaked water through faulty hood seals and suffered a range of other problems. Ford did finally stomp on all the Capri’s bugs but Head Office in the USA – where the cars sold as the Mercury Lynx – said ‘no more’ and its fate was sealed. Non-turbo cars that look and drive OK can be found for the ridiculous sum of $3000. Early turbo versions have 100kW engines instead of 61kW but feeding that quantity of grunt through a pair of skinny front tyres also produces some interesting control issues in wet weather. Pick of the Capris are rare 1992-94 Clubsprints that come with fluorescent seat trim, a hood that excludes water more effectively than a duck’s sphincter and can be found for $10,000. 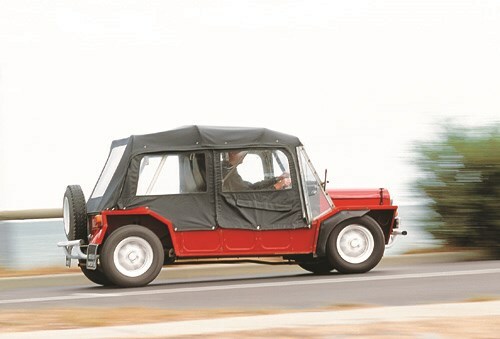 If you think the Moke looks like a motorized box-trailer, you’re not far wrong. It was designed to be packed with gear and parachuted out of military aircraft, with survivors providing transport in harsh terrain. Early ones came with dinner-plate wheels but 1969 saw them grow from 10 to 13 inches. Later came ‘Californian’ models in bright colours and with ‘flower-power’ or denim-like roof materials. Most Moke roofs are now ratty and ripped, but these cars were never intended to be warm, dry or comfortable. If you’re a wuss about getting wet, don’t buy one. With light weight and go-kart handling, Mokes are great fun and can easily wring 350 kilometres from the 28 litre fuel tank. Pick of the engines was the 40kW 1.3-litre and some later versions came with disc front brakes. Cheap Mokes are hard to find and probably trouble if you do. Restored with a galvanised, rust-cheating body they can cost $15,000. Honda built its name on motorcycles and during the 1960s made some quirky sports cars but the CRX was its first attempt at a mainstream performance model. The original version sold from 1987 was chunky and cheeky with a chopped off tail and rear window so flat that rear vision was virtually zero. It only had 1.6 litres but also only weighed 900kg, so the 95kW extracted from the twin-cam engine could be used very effectively. Briefly raced as a Production Car – before rules were changed to exclude them – CRXs made more powerful cars look stupid on tight tracks. Driven gently, the little Honda sips less fuel than a Corolla of similar age but reacts far more ferociously to a prod on the throttle. The young drivers who during the 1990s lowered these cars until they spat sparks and painted them in polychromatic colours have largely moved on to later, turbo-engined imports. The few CRXs that remain unmodified sell well short of $10,000 and even pensioned off show-cars are available in the vicinity of $15,000. The WRX has of late become the equivalent of a boxing champ who should have retired years ago. Bloated and blinged, the new ones attend social functions rather than piss-ups and don’t excite anyone who remembers the ‘Rex’ when it was young and hungry. Early WRXs in really good condition are hard to find, yet not expensive. A decade back, you’d hear the guttural snarl of the turbo-ed flat-four almost daily but now they are rarely sighted. A lot were stolen and stripped and many more were crashed then rebuilt using parts from the ones being stolen and stripped. Spending $12,000 will open a range of WRX doors, but pick one that hasn’t been too severely rearranged. If the panel gaps are iffy and it’s being sold by someone wearing a shark tooth necklace – leave. Pushing hard will see $100 worth of fuel gobbled within 500km but the WRX can be as frugal as its driver allows and even the insurance companies have relented on previously-astronomic premiums. For family buyers with attitude, there’s also a moderately-practical Hatch version. Arguably the smartest sports car of the past 50 years, the MX-5 is undeniably the most successful. Within 10 years of its 1989 release, 722,000 had been built and the MX-5 became the biggest-selling sports car in history. Bucking the trend towards front-wheel drive, the MX-5 design team insisted that their car be rear-wheel driven; using as its template the 1960s Lotus Elan. 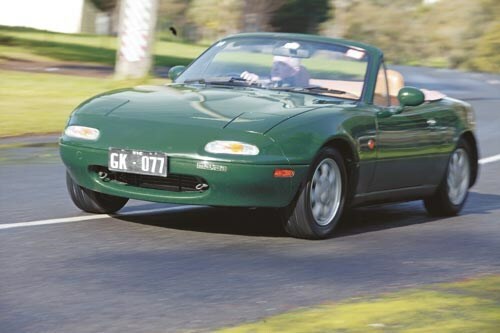 Despite being powered by an uninspiring 1.6-litre engine, the MX-5 compensated for any performance disappointments with frugal fuel use and the best chassis you could buy for under $50grand. 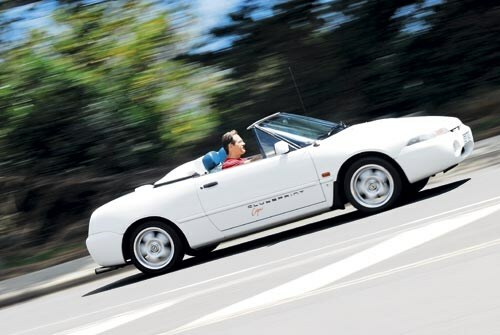 Keeping faith with its Lotus-like shape and design, the Mazda had hidden headlights, a cramped cabin and better brakes than it knew what to do with. Service and parts are yet to become a problem and several clubs exist to encourage spirited road and track use of your MX-5. Lots were bought as day-off cruisers by people who then never took a day off. Even though these cars cost a little more than the $8000 being asked for early-1990s models in average condition, they are the ones to track down. Following World War II, the French motor industry needed a kick-start and this slab-sided small car with its corrugated steel bonnet was greeted with glee. The ‘Deux Cheveaux’ was equally attractive to city or country-dwelling French-persons. Despite a tiny 425cm3 engine, it would carry a family in minor comfort at speeds up to 70km/h and was claimed capable of carting a load of fresh eggs across a ploughed field without breaking any. Egg farmers were big fans of the 2CV. Hardly any 2CVs sold new in Australia but the 1990s saw dozens being imported, mostly from the UK. Paintjobs included fake wickerwork embellishments and were appealing to the more artistic members of the motoring community. Other buyers were simply barking mad. Engines in these imports are generally the larger 602cm3 units, so they will get along at a reasonable pace and use 30 percent less fuel than a Mini. 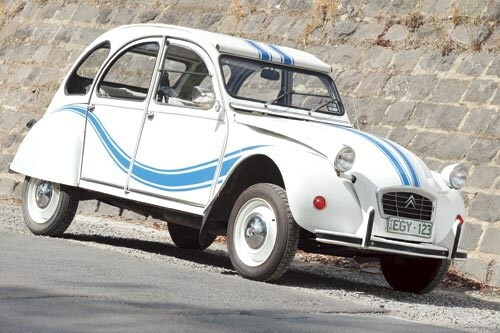 Prices start at $10,000 and the best place to find one is your nearest Citroen car club. 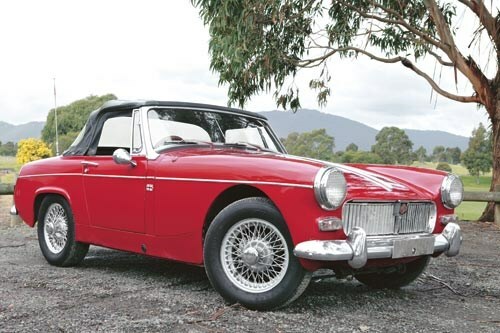 With its bare-bones cabin and grumpy four-speed gearbox, the MG Midget was old-fashioned even 40 years ago. Using a similar engine to the Mini Cooper S, Midgets are far more responsive than earlier 1.1-litre Sprites with which they share their shape and lots of other components. Top speed is close to 150km/h, allowing the MG to plug along at freeway pace without getting overwrought. Purists scoffed but Midget buyers appreciated the wind-up windows, heater/demister and a hood that could be folded neatly into the space behind the rear seats. The original steering wheel was large with deadly-looking wire-sprung spokes. Owners would commonly replace it with a smaller and alloy-spoked item. Low gearing hurts fuel consumption far more but the classic badge and sparkling wire wheels compensate. If you still need convincing, average Midget values are up 50 percent on 2004 levels and good cars cost more than $12,000. 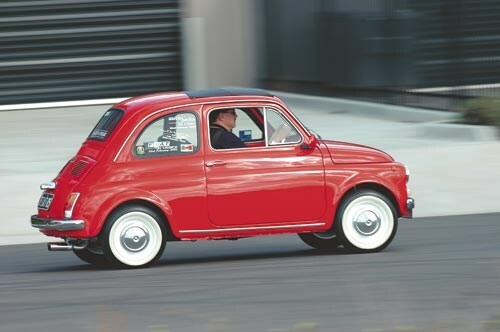 We’ve left the littlest of our clever cars until last, because the original Fiat 500 is an acquired and fairly exclusive taste. These tiny, rear-engined Fiats were released in 1957 and local sales stopped in1972 but plenty have survived. That ‘500’ in the model name really does equate to an engine size of 500cm3 – just half a litre – yet they will reach 100km/h and cruise happily at 90. Shorter and narrower even than a BMC Mini, the littlest Fiat is comfortable for two and will fit an extra pair of contortionist adults into the rear seat for short trips. The four-speed manual gearbox doesn’t have synchromesh, so you’ll need to double-declutch like an old-school truckie to master smooth downchanges. After a little practice, it’s easy. With spare parts still plentiful, these aren’t a difficult car to keep running or restore. Combining that kind of practicality with undeniable cuteness has helped restored 1960s cars reach $15,000.